Nessie wrote: It says what they want to hear. Testimony is being cherry picked down to parts of sentences as the deniers try and pretend they have evidence. I hope you aren't including me as a denier Nessie. I've been very careful to not deny anything presented by the Holocaust Promotion side. (H.P. side). That is one of the reasons why I am sorry, but I do not think you are genuinely enquiring into the Holocaust. The very fact you call it HP makes me suspect you. I have discovered though that some of the information being passed on by the book-kid has proven to be unreliable. Again, you post and post about name calling and then use name calling yourself. That makes you look rather hypocritical. I have to do this the way that can answer some questions for me Nessie. That you have your own method, rather than you follow the historical method, which is the most appropriate and proven method of enquiry, makes me suspect your motives. That is, I read claims being made by the H.P. 'ers and then check them out on the internet. If you were genuine, you would also do that to the claims made by the deniers. You have admitted that you only check one version of events. Checking it on the internet is not really sufficient either. As I did with the lie of no hospitals being at the AR camps. I didn't know there were hospitals at some of the AR camps. I knew about there being a hospital at Auschwitz-Birkenau. Can you link and quote who lied? There is clearly a degree of ignorance about hospitals at the camps, which is why I started this thread. I note that you are not at all critical of VFX and his claims that only the sick and disabled were unloaded at Sobibor and they were assisted to a hospital in Lager III of the camp. Yet the evidence presented contradicts that claim. Why have you let that pass? (assuming such camps even existed) Then when I find clear evidence on hospitals, we can get into the size, use, for who, etc., or, the possibility that the testimony is real testimony or is just another of the 'liars and exaggerators'. Still not being able to come to any hard and fast conclusions. But a little wiser due to being lied to. Please bear with me in not getting into denying anything. Being a skeptic is where I'm at and there's no real reason why I should be having to put up with the bad behavior of the usual culprits. And thanks again for staying straight, even though you have received some of their flak for doing so. OK, so use the historical method of enquiry. Ignore and don't participate in the name calling. Critically examine what is presented by the deniers here as you do other evidence. The exact function of the camp is hearsay, and could have changed from week to week, depending upon the expediency of the time. Many deniers (I love that term now) claim that these were labour transit camps, which is also quite possible. There were probably shower facilities, especially if people had to stay overnight and to prevent typhus, hygiene is essential which is why the hair was shaved. These camps are also more or less the half way points to other industrial centres like Birkenau and in a way acted like the Inns of old. During the day the sick and elderly got off the train if there was time for the transports to move to Lublin which was overcrowded most likely. You can probably think of Sobibor and Treblinka as a home away from home, a respite. There was no real industry there most likely. Evidence please. Shower facilities for 10s of 1000s of Jews arriving to the camp, that’s what we are after. Note change in your “theory”: the hospital is now a place for an overnight stay - which 100s of 1000s came to but didn’t leave. “Transit” implies going somewhere else. You know and we know that you have not shown that 100s of 1000s of those brought forcibly to these camps left. We are patient. Give it another try. The exact function of the camp is hearsay, and could have changed from week to week, depending upon the expediency of the time. Your evidence of its purpose is.....? Many deniers (I love that term now) claim that these were labour transit camps, which is also quite possible. The denier Eric Hunt came up with that one. He now accepts he was wrong as he cannot evidence mass transports back out of the camps. Water supply, pipe work and drainage? No witnesses to showering. especially if people had to stay overnight and to prevent typhus, hygiene is essential which is why the hair was shaved. These camps are also more or less the half way points to other industrial centres like Birkenau and in a way acted like the Inns of old. Show that on a map. During the day the sick and elderly got off the train if there was time for the transports to move to Lublin which was overcrowded most likely. Your claims are getting more and more ridiculous. That is why I think you are just trolling as you know you can get a rise out of most of the other posters here. You are left with having a bit of fun by provoking others with the stupid claims. It is not a claim, that is the only logical conclusion. The fake claim is from the holocaustians who just love their mass murder, even when it involves innocent hospitals and over night camps. Who knows there could have been a creche there as well. Apart from your lie witnesses which is all they are, there is nothing else. VFX wrote: It is not a claim, that is the only logical conclusion. The fake claim is from the holocaustians who just love their mass murder, even when it involves innocent hospitals and over night camps. Who knows there could have been a creche there as well. Apart from your lie witnesses which is all they are, there is nothing else. Since it disregards all the evidence - from witnesses to archeology, from records and documents - and explains nothing - like what happened to the 100s of 1000s of Jews brought from across Poland and elsewhere to these camps - it is not only illogical: it is a fantasy. Batshit crazy. Comforting to Nazis and anti-Semites to be sure, but a sick fantasy just the same. Statistical Mechanic wrote: Since it disregards all the evidence - from witnesses to archeology, from records and documents - and explains nothing - like what happened to the 100s of 1000s of Jews brought from across Poland and elsewhere to these camps - it is not only illogical: it is a fantasy. Batshit crazy. Comforting to Nazis and anti-Semites to be sure, but a sick fantasy just the same. Well I have just discredited either a fine author or the witnesses; you choose: this is regarding the selection or lack of selection at Sobibor: both are mutually exclusive. The witnesses clearly say they went all over the place, or do I need to show you again. Could be comforting to Nazis or anti-Semites but as I personally know none of those kind of people I cannot possibly comment. It is not fantasy, I am hoping to instill a sense of reality to help you sleep better at night. Sometimes we need the truth not just Teddy bears. Again, you're ignoring the context. Re-read what I told you about those witnesses, the transports they were on, the bulk of the transports - and try again. As Nessie also said, you're ignoring what went on with the bulk of the transports and vast majority of Jews brought to Sobibor. Or, to put it differently, I didn't ask about small numbers but about "what happened to the 100s of 1000s of Jews brought from across Poland and elsewhere to these camps." Your version of a logical conclusion is to claim all the witnesses lied and then speculate on something that is not evidenced in any way. That is not logical at all. Well I have just discredited either a fine author or the witnesses; you choose: this is regarding the selection or lack of selection at Sobibor: both are mutually exclusive. The witnesses clearly say they went all over the place, or do I need to show you again. You have not shown an assessment of accurate witness testimony at all. ALL the witnesses speak to arriving at the AR camp, a selection next to the trains, those selected to work leaving the camp and those not going further inside the camp. No one speaks to not being selected to work and going to a hospital. Could be comforting to Nazis or anti-Semites but as I personally know none of those kind of people I cannot possibly comment. It is not fantasy, I am hoping to instill a sense of reality to help you sleep better at night. Sometimes we need the truth not just Teddy bears. Comments like that are designed only for you to try and convince yourself. You resort to language like that because you cannot evidence your beliefs. So we are back to the Nessie mantra, of selections. I am not convincing myself at all Nessie. You are reading the mountain of excrement thinking it is real. Please try and get rid of your horror glasses. it wasnt like what you want it to be. The only reason why you want it that way like the Shoah business is $$$$$$$$$$$$$$$$$$$$$$$. Not even Netanyahu is buying that one no more. The holohoax is done. Ah the anti-Semitic $$$$$$$ and other mindlessness: recycled nonsense and bravado masquerading as thought ... got it, guppie. ZZZZZZZZZZZZZZZZZZZZZZzzzzzzz jeez the arrogant one is boring. VFX wrote: So we are back to the Nessie mantra, of selections. I am not convincing myself at all Nessie. Why? There is a lot of evidence it happened. You are reading the mountain of excrement thinking it is real. Please try and get rid of your horror glasses. it wasnt like what you want it to be. The only reason why you want it that way like the Shoah business is $$$$$$$$$$$$$$$$$$$$$$$. Not even Netanyahu is buying that one no more. The holohoax is done. The excrement is coming from you and your unevidenced assertions and bias. From my POV, it's not the evidence that is neither proven or disproven, such as the stories that can be true. It's the evidence that can be logically questioned and shown to be lies and exaggerations. There's no use in anyone trying to deflect from that, and especially in the way you continue to do so. If you don't face the counter charges head on then the only explanation is that you need to resort to the bad behavior. I'm not going to let that go away until you can man up and stop doing it. It serves you no real purpose and I can say it has no real effect on your foes. It diminishes you! What about that which cannot be evidenced at all? Do you agree that if a claim is made and there is no evidence, it did not happen? No Nessie, I'm a rational person and I think in a rational way. Some claims will be made that can never be proven or disproven. Some claims will stand up to close scrutiny and some won't. I've heard both of course. My job as a skeptic is to question the claims that can't stand up to scrutiny. Those that 'can' stand, I won't continue to belabor by questioning them further. I claim a right to my position here and it's not deserving of receiving the bad behavior I experience from some of the others. Here's where I choose to go right now. There have been two different drawings shown for Treblinka 1 and 2. Where are the hospitals in either of those camps? One or the other or both of those drawings won't stand up to scrutiny. That is not correct. You have no basis for concluding that. What was the language in which Sperling gave the testimony you quoted, and what word in that language did he use for hospital? Statistical Mechanic wrote: That is not correct. You have no basis for concluding that. Make your assertions you are alluding to and I'll deal with them. I have no interest in dodging any of your questions. Just make your assertions clear. I 'think' you are suggesting lack of proper translation? Then what were you going on about? And why would the maps not stand up to scrutiny? montgomery wrote: I 'think' you are suggesting lack of proper translation? I am not asserting anything. A question isn’t an assertion. I am asking to find out what Sperling said and what wording he used. That said, HEART is a dodgy source. Since c850,000 people are alleged to have left TII by the deniers, but not one witness, document or another piece of evidence can be found to back that up, is it rational to say there were no mass transits back out of the camp? It is incredible to claim c850,000 people left TII without any of them leaving any evidence at all. Would you agree to claim those people left does not stand up to scrutiny? I do not where they were. I suspect no one does for certain. The various plans of the camps vary and only agree on certain placings, such as where the trains entered and where the gas chambers were at TII. I'll deal with your arguments and claims in the best way I know how. That is, with my very limited knowledge. I won't run from any discussion. Period! Just be prepared to accept my limited ability to answer the questions. The onus is on you, you quoted Sperling. I am not suggesting anything. Let’s put it this way: if I wanted to question a mass of evidence that suggests one thing with a single line from a single witness, I’d damn well want to know what the witness actually said, not what appears in a HEART translation. For all I know HEART has it right - or wrong. But you used the quotation and now you can’t support using it but you still insist it trumps all the other evidence. That’s skepticism for you! Since we are all struggling to find evidence of a hospital, I think it would be safe to say that the claim TII and Sobibor was a stop so people could be dropped off for medical treatment in a hospital is wrong. Statistical Mechanic wrote: The onus is on you, you quoted Sperling. I am not suggesting anything. Let’s put it this way: if I wanted to question a mass of evidence that suggests one thing with a single line from a single witness, I’d damn well want to know what the witness actually said, not what appears in a HEART translation. For all I know HEART has it right - or wrong. But you used the quotation and now you can’t support using it but you still insist it trumps all the other evidence. That’s skepticism for you! I honestly have no idea what you're talking about when you mention HEART? An acronym? I'm anxious to hear what you think he really said. I think you are suggesting that the word 'hospital' was an incorrect translation in 'some' language? But I guess I'll just have to leave it up to you to elaborate further?? Really S.M., if you're an expert or not, I never thought that you would make my job so easy. My lack of knowledge here is not hampering my ability to stand toe to toe with you at all. I'm beginning to suspect that your position as an H.P. 'er is deficient in some way. Is it that the holocaust is all hat, no cowboy? It's the skeptic's job to get around to finding out. For now I'll just say that it's you that's all hat and you're doing your side of the debate a great disservice. Eggs too! That could be but it's still not answering to the question of the witness referring to a hospital. Bad witness? Bad translation? Inconvenient facts? Must go now, catch you later. HEART is the unreliable and unscholarly website you quoted from. I have told you now more than once: I don’t know what word Sperling used in the language he testified in. This explains why I asked you. Because you are relying on this one comment to challenge a lot of other evidence. montgomery wrote: I think you are suggesting that the word 'hospital' was an incorrect translation in 'some' language? But I guess I'll just have to leave it up to you to elaborate further?? One more time: no. I am asking you to give details about your source which, if it were mine in a similar situation, I’d make sure I knew. Before using it as you are trying to use it. montgomery wrote: Really S.M., if you're an expert or not, I never thought that you would make my job so easy. My lack of knowledge here is not hampering my ability to stand toe to toe with you at all. I'm beginning to suspect that your position as an H.P. 'er is deficient in some way. Well you are coming across as both obnoxious and intellectually challenged. If that’s your goal and it pleases you, well done. Your need to dance around post after post to cover up the fact that you used a source you can’t defend (Sperling) and made a claim you can’t defend (that the maps are problematic) makes you out to be less a skeptic and more an obstinate fool. Since you can’t answer the first and most basic question about Sperling, it is his reference to a hospital, not the other evidence, that remains up in the air. Despite this, your brand of skepticism has you questioning all the other evidence. Which is what a crank or conspiraloon would do. Not sure I would attribute the translation of Sperling to Heart. "Camp No. 1 also contained what was called the lazaret (infirmary), a long building measuring 30 x 2 meters. Two men were working there. They wore white aprons and had red crosses on their sleeves; they posed as doctors. They selected from the transports the elderly and the ill, and made them sit on a long bench facing an open ditch. Behind the bench, Germans and Ukrainians were lined up and they shot the victims in the neck. The corpses toppled right into the ditch. After a number of corpses had accumulated, they were piled up and set on fire." Balmoral95 wrote: Not sure I would attribute the translation of Sperling to Heart. I am pretty sure I know where it comes from, but not 100% sure. My point is that to use the quoted snippet for the purposes here, you need to know about the translation and the original. Despite what montgomery keeps repeating, I don't know what the original says and I don't have a suspicion that anything has been mistranslated - but I would be careful with HEART material, and I would try finding out language and key words of the original. That's all. Last edited by Statistical Mechanic on Fri Sep 14, 2018 11:38 am, edited 1 time in total. I agree in part - I think there's a step missing. The one witness quoted by montgomery used a word in whatever language he testified in that has been translated to "hospital." He may have used a word that can be translated only as "hospital," for sure, but a skeptical method that runs with that snippet without asking about it is not very impressive. And, agreed, if the translation is the best and firm, then we still have a problem of multiple witnesses vs that single testimony. As a result of starvation and living in cold barracks during the winter of 1942-43, an epidemic of typhus broke out. A special office was set up, called the Krankenstube (sick room. But when a worker with a temperature of 102 reported to the physician and the physician recommended that he be put to bed in the Krankenstube, there appeared Unterscharfuhrer Miete, whose speciality and favourite pastime was the “selection of workers.” Five minutes later the patient was taken to the “infirmary” where he was cured by a bullet. Last edited by scrmbldggs on Thu Sep 13, 2018 9:19 pm, edited 2 times in total. In the last weeks of my stay in the camp, the Jewish physician succeeded in obtaining soporifics which were injected into each patient before he was executed; he was taken to the “infirmary” only after he had fallen asleep. It also happened that a typhus patient was sometimes given an injection by the order of Miete. Miete would ask the doctor when the patient would be asleep. The physician would answer, “In 20 minutes.” Twenty minutes later stretcher bearers led by Miete would appear, to find the patient eating his ration of black bread with a healthy appetite. Consternation all around, but his Excellency Elite Guard Miete, must not fatigue himself for nothing, he would order the patient to be put on the stretcher and taken to the “infirmary” in spite of his obvious recovery. "Reporting sick is not really a possibility either, you are only admitted to the hospital with a fever of over 40 degrees, and anyone who is ill for more than six days is shot. In general, death by shooting became a daily occurrence. The Jews who had been shot were replaced by new workers from the latest transports." I think that Jeffk alluded to this at one point: Arad discusses a couple times an “infirmary” in IIRC one of the barracks in the living area of Treblinka (I believe that Arad got this from Krausnick); I don’t have my “library” with me this trip and so can’t check - but my impression is that the infirmary was rudimentary and that what Nessie and scrmbldggs have quoted fits with Arad’s description. No mention of a maternity ward, large staff of physicians and nurses, etc or the purpose of the camp being to process nearly 800,000 people through advanced medical screening and treatment. Go figure. Statistical Mechanic wrote: I think that Jeffk alluded to this at one point: Arad discusses a couple times an “infirmary” in IIRC one of the barracks in the living area of Treblinka (I believe that Arad got this from Krausnick); I don’t have my “library” with me this trip and so can’t check - but my impression is that the infirmary was rudimentary and that what Nessie and scrmbldggs have quoted fits with Arad’s description. No mention of a maternity ward, large staff of physicians and nurses, etc or the purpose of the camp being to process nearly 800,000 people through advanced medical screening and treatment. Go figure. Yes, just a rudimentary “infirmary,” certainly not a hospital in a true sense of the word. It was basically a place where a limited amount could rest and try to recover some strength. Arad mentions that the doctors stole some medication from camp stores and tried to treat some of the sick Jews. It’s unknown whether or not there was anything like this st Belzec and nothing like this at Sobibor. There was nothing resembling an infirmary in the extermination area at Treblinka. I’ll pull up Arad’s book when I have a minute and check footnotes. Jeffk 1970 wrote: Arad mentions that the doctors stole some medication from camp stores and tried to treat some of the sick Jews. Much the way modern hospital facilities "fully staffed with all the Jewish doctors, nurses, and health care professionals" do, eh? Jeffk 1970 wrote: It’s unknown whether or not there was anything like this st Belzec and nothing like this at Sobibor. 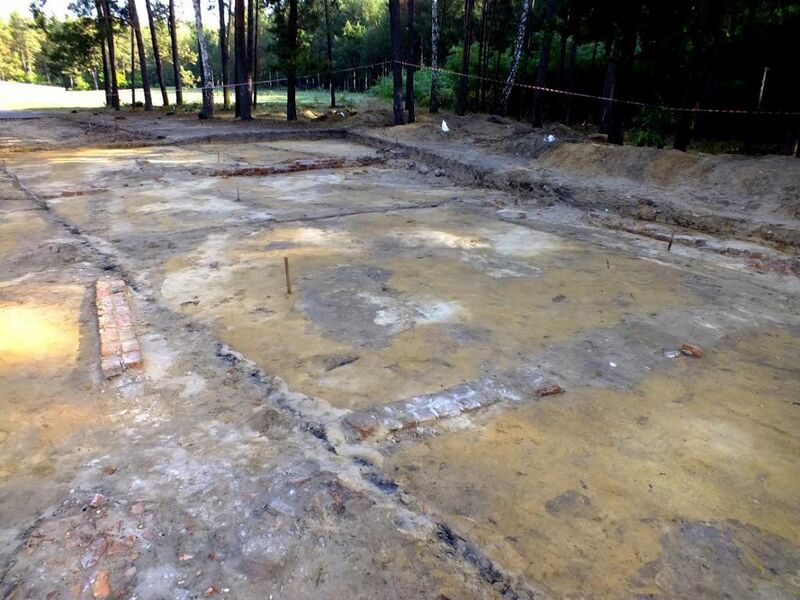 There was nothing resembling an infirmary in the extermination area at Treblinka. My recollection is that Arad says that there was not anything like the Treblinka set-up at the other AR camps. As I say, I am Arad-less at the moment. And my memory . . . enough said. I’ve got a digital copy of Arad, I’ll pull it up when I get up and about later.